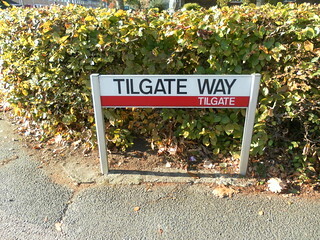 Crawley is well known for its distinctive street name signs, each with the neighbourhood name in a coloured band at the bottom. Each neighbourhood has a different colour (see another photo in this set for the full list! ); Tilgate’s is red. Taken on 20th October 2011. I’ve got quite a collection of these from the various neighbourhoods (photos, that is!). They fascinate me, and I am pleased at their consistent use even on new (post-Development Corporation) roads. If Crawley ever gets its 14th neighbourhood (and I have a number of pics on that theme to add to this group shortly! ), I wonder what colour will be adopted?